Jim Clark had won the Belgian, French, British and Dutch GPs and arrived at the Nurburgring looking for a fifth consecutive victory. Having won in South Africa at the start of the year Clark knew that a sixth win would give him maximum points in the World Championship as only six events counted for the title. And with three races to go after Germany Clark could not be caught if he could win at the Nurburgring. In qualifying he was over three seconds a lap a lap faster than his nearest challenger, Jackie Stewart in the second BRM. 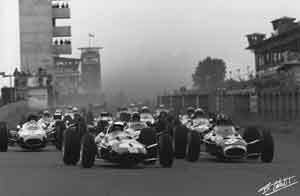 Sharing the front row with the two Scotsmen were Graham Hill (BRM) and John Surtees (Ferrari). The second row featured Dan Gurney's Brabham, Mike Spence in the second Lotus and Lorenzo Bandini in the second Ferrari, while the third row saw Jochen Rindt's Cooper ahead of Jo Bonnier (Rob Walker Brabham), Rindt's Cooper team mate Bruce McLaren and and Jos Siffert in the second Rob Walker Lotus. Gerhard Mitter appeared in a third Lotus while the increasingly competitive Honda team decided to miss the German race and make modifications before the Italian GP in mid-September. Clark went into the lead at the start with Hill chasing and Stewart third. Clark was completely dominant however and repeatedly broke the lap record as he disappeared into the distance. Hill tried to keep up but Stewart pushed too hard and went off at Wipperman and had to retire with a damaged suspension. This left Gurney in third. The three front-runners would remain unchanged for the rest of the race while the battle for fourth place ebbed and flowed in the course of the first 10 laps. Eventually Rindt took the position but only after McLaren, Spence and Hulme had all gone out with mechanical trouble. Clark duly won his sixth victory of the year and the World Championship.